LOOKING FOR AN ABSORBENT AUTOMOTIVE WASH CLOTH? Detailers, valeting companies, automotive wholesalers and retailers, car wash depots - they are all looking for an economical yet very effective automotive car wash cloth. Well they need look no further, as TIDDOX has introduced its premium product, MAXI WIPES designed to answer the needs of these companies. Made from soft rayon material that will not scratch surfaces, and thick heavy weight absorbing viscose, the MAXI WIPES are the solution for automotive car washing and drying. 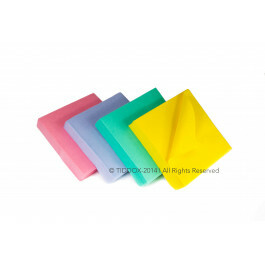 These automotive sponge cloths will rapidly dry the body of a vehicle removing any dirt and dust, and ensure an effective cleaning result without scratches. Capable of absorbing up to 8 times their own weight in liquids, MAXI WIPES are similar to a sponge that absorbs, can be squeezed, rinsed and reused, making them very useful in washing and drying vehicles and mopping up spills. The ultra absorbent nature of this product allows rapid drying of all sorts of liquids thereby saving both time and money. Available in convenient packs of 10 thick, absorbent wipes, these non-abrasive automotive cleaning cloths are relatively inexpensive when compared to the chamois on the market. Cost savings, without any compromise to quality or absorbency. So, if you are looking for an absorbent automotive wash cloth, give the MAXI WIPES a try! A quality product at an affordable price! In addition to the automotive wash cloths, TIDDOX also has a range of other automotive cleaning cloths specific to other tasks such as engine maintenance, interior detailing, windscreen wiping, polishing, low lint applications, and absorbing grease, oil and and solvents. Some suggestions are the SOLVENT RESISTANT WIPES, the WORKBENCH RHINO WIPES BOX, and the GIANT SHAMMY WASH CLOTH.